In the midst of one of the longest economic expansions in decades, we have not been the only analysts to note signs of a modest but real reversal of fortunes in small town and rural America. Rural and smaller-town places seemed to be “winning a little more” in 2017, even though the larger trend in the 2010s has been for the nation’s biggest, bluest metropolitan areas to dominate job growth. 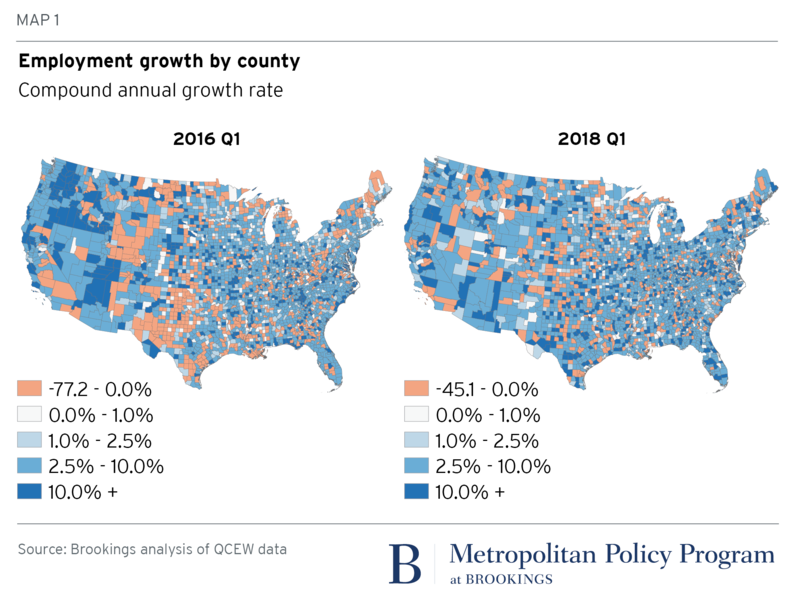 During President Trump’s first year in office, in fact, rural places captured a slightly disproportionate share of U.S. job growth, while the nation’s big cities slightly underperformed. It was good to see more places participating in the nation’s economic expansion. Which raises the question: How are things looking as the politicians leave Labor Day behind and lock in on the 2018 midterm elections, with their volatile themes of division, imbalance, and resentment? To see, we have looked at several go-to resources and observe again that the more balanced growth picture of last year is continuing, with more places participating in the economic good times. As the elections approach, smaller, redder places are doing relatively better than they were in 2016. The central dynamic of the Trump period persists. 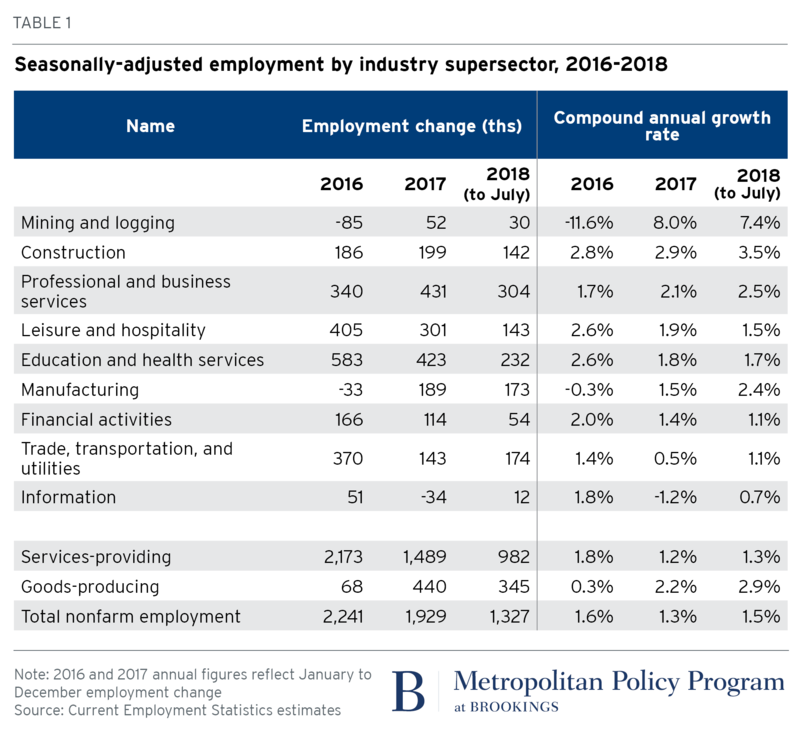 As Table 1 shows, goods-producing industries have been surging while services industries have seen their seasonally adjusted employment growth slow since 2016. To be more specific, while information-sector growth has turned negative in the last two years (with a slight recovery starting in 2018), resource extraction and manufacturing industries have been growing at their fastest rates since the financial crisis. Mining and logging pursuits (which include oil and gas extraction) have seen rapid employment growth based on strong hiring in the various support activities associated with the sector like exploration and prospecting. Meanwhile, machinery manufacturing; electrical equipment, appliance, and component manufacturing; and fabricated metal product manufacturing have all been growing smartly as domestic demand has kept factories humming. These patterns are notable for what they say about the contours of national economic activity but also because they reflect what’s happening on the ground, in particular urban and rural areas. And in this regard, the dynamics of the current economic surge—strong goods production and relatively weaker services provision—slightly disfavor larger, bluer, tech- and service-oriented metros, and relatively favor smaller, more rural, and redder communities by comparison to their recent problems. This conclusion aligns with the findings of smart analysts like Jed Kolko of Indeed. 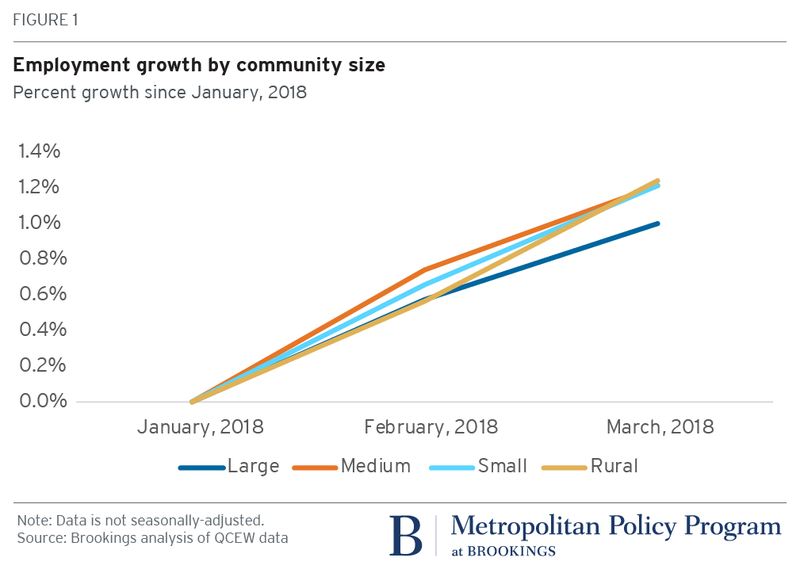 And it suggests that growth patterns are now playing out fairly positively for many if not all smaller communities and rural areas. Likewise, while the bulk of the nation’s job creation has continued to take place in the nation’s 52 largest metropolitan areas with 1 million residents or more, the employment growth rates of smaller and rural communities actually outpaced those of both the nation and other types of communities earlier this year (Figure 1). This performance was stronger than last year’s. Whether or not seasonal trends portend slower smaller-town and rural growth through the late summer and fall as they often do, the fact remains that smaller communities have been doing relatively better this year. As to what this means for the fall election, it is no doubt good news for the reeling Republican Party as it slouches towards the midterms. To be sure, very little of the favorable economic shift likely owes to President Trump’s erratic flailing and bluster. As Kolko notes, the rebound of mining employment tracks global oil prices closely. And for that matter manufacturing growth likely reflects normalizing domestic purchasing and stronger global demand. Yet, the current dynamics could be helpful to the Republicans, to the extent that the direction of economic change—measured by employment growth—influences political sentiment and political behavior. After all, counties that voted for Hillary Clinton in 2016 experienced 4 percent annualized employment growth in the first quarter of 2018, unchanged from the first quarter of 2017, whereas counties that voted for Trump were seeing growth of 5.1 percent a year earlier this year, up from 4.9 percent a year before that and 4.3 percent in early 2016. Many small-town and rural communities may be feeling that things are finally moving in the right direction. With that said, the political impacts of these incremental growth shifts toward redder counties will likely be modest, and are likely temporary. Cultural rage appears at this point more central to red America politics than economic soothsaying. Beyond that, both near-term and longer-term headwinds lie ahead. In the near term, Trump’s chaotic trade stances may still cost counties manufacturing jobs. Over the longer term, the cyclical nature of many of the industries that have contributed to the current rural and small-town uptick—ranging from agriculture and mining to oil and gas—does not make those commodity industries reliable sources of sustained prosperity. Nor do smaller communities’ education deficits, shortages of digital skills, and specialization in the types of rote jobs that will be most susceptible to automation and globalization. For now, a little winning in small-town and rural America is welcome news for a nation that has mostly been pulling apart during the last decade. In 2017, rural places won a little more, but will it last?